As the 2015 college football season kicks off, country music superstar Brad Paisley will be taking his show to select IMG College partner universities to provide free entertainment for the campus community. 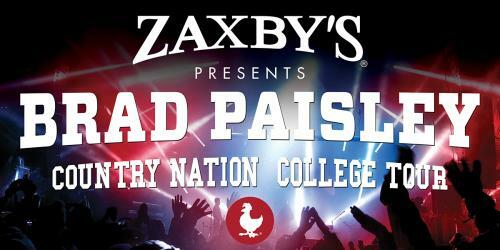 The “Country Nation College Tour presented by Zaxby’s” will roll into Blacksburg, Virginia on September 6 and set up on the Virginia Tech campus. Breakout country artist Eric Paslay will be the special guest. Other dates announced are September 10 – The University of Texas with three time Grammy nominee and Texas native Pat Green as special guest, September 11 - Baylor University with the comedy band The Raging Idiots (which features special guest Bobby Bones and Eddie from iHeartMedia’s national country radio program The Bobby Bones Show), and September 12 – University of Arkansas, also with The Raging Idiots as the special guest. Details on each show, as well as additional university dates, will be announced in the coming weeks. Paisley is currently poised to hit the radio airwaves with “Country Nation,” the newest single from his chart-topping album, Moonshine in the Trunk. Shipping to country radio on August 31 with an official airplay impact date of September 14, “Country Nation” was written by Paisley and his longtime collaborators Chris DuBois and Kelley Lovelace. A celebration of the blue-collar spirit and America’s passion for sports, the song weaves-in a shout-out to 18 college sports mascots. Paisley’s affection for college football runs deep. He plans to once again serve as a spokesperson for “College Colors Day,” a nationwide celebration of the new college football season, which was created by IMG. He has also appeared as a celebrity guest picker on the ESPN show “College GameDay” at West Virginia University. Brad Paisley is a critically acclaimed singer, songwriter, guitarist and entertainer whose talents have earned him numerous awards, including three GRAMMYs, two American Music Awards, 14 Academy of Country Music Awards and 14 Country Music Association Awards (including Entertainer of the Year), among many others. He has been a proud member of the Grand Ole Opry since 2001. Paisley has written 20 of his 23 #1 singles with the first being his 1999 hit “He Didn’t Have To Be” and his most recent, “Perfect Storm,” from his chart-topping 2014 albumMoonshine in the Trunk. Paisley kicked off his Crushin’ It World Tour the middle of May by playing to over 50,000 fans the first weekend. Paisley has partnered with Boot Barn and developed an exclusive line of jeans, hats, T-shirts, jewelry, belts and woven shirts called Moonshine Spirit by Brad Paisley. Fans can look for him and Carrie Underwood to return as hosts of “Country Music’s Biggest Night™” for the eighth consecutive year when “The 49th Annual CMA Awards” airs live from Nashville onWednesday, Nov. 4 (8:00-11:00 PM/ET) on the ABC Television Network. Connect with Brad at www.BradPaisley.com,www.Facebook.com/BradPaisley, on Twitter @BradPaisley, on Instagram@Brad Paisley, and YouTube at YouTube.com/BradPaisley. Enjoying the best chicken around in an atmosphere where you could be yourself―that’s what childhood friends Zach McLeroy and Tony Townley wanted to achieve when they founded Zaxby’s in 1990. Many years and locations later, Zaxby’s is still delivering on that promise: to serve delicious chicken fingers, wings, sandwiches and salads in a fun, offbeat atmosphere where all customers are welcomed as friends. In 2015, Zaxby’s was the No. 9 fastest-growing chain in the Nation’s Restaurant News Top 100 list. Entrepreneur magazine ranked Zaxby’s as one of the fastest-growing franchises and as a Top 500 franchise. In Technomic’s Consumers’ Choice Awards, Zaxby’s was named the Most Craveable fast casual restaurant chain (2014), and as the chain with the Most Unique Items You Can’t Get Elsewhere (2015). Zaxby’s operates more than 700 locations in 16 states and is headquartered in Athens, Georgia. For more information, visit zaxbys.com orzaxbysfranchising.com.